Rolling Stone (10/28/71, p.48) - "...On the evidence of IMAGINE, I don't think that John has resolved the manner in which a masterpiece and an artistic dead-end like POB can succesfully be followed....But then, great artists, of whom John is one, are nothing if not resourceful..." Q (7/00, p.140) - Included in Q's "The Best Male Angst Albums Of All Time" Q (4/00, pp.104-5) - 4 stars out of 5 - "...a strange, contrary record with touches of genius....extraordinarily beautiful....it is a signpost to one of the 20th Century's major figures....proof that genius is a series of fleeting moments..." Mojo (Publisher) (4/00, p.106) - "...Contains both the best and worst of the man - the idealist and the ranter, the righteous and the vindictive anger....So you take your choice between the pantheistic songs or the pissed-off plodders..." NME (Magazine) (9/18/93, p.19) - Ranked #34 in NME's list of The Greatest Albums Of The '70s. 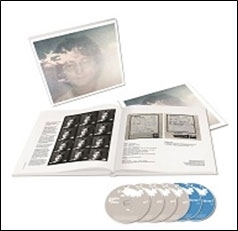 Considered together, IMAGINE and its startling predecessor, PLASTIC ONO BAND, paint a vivid picture of the state of John Lennon immediately post-Beatles. If PLASTIC ONO BAND found John working out his hitherto repressed feelings about childhood and stardom, then the abiding impression of IMAGINE is John's one certainty in this storm of doubts and recrimination: his love for Yoko. "Jealous Guy," with its peerless vocal and a spot-on arrangement for strings, is sublime. "Oh My Love" is all delicacy and melodiousness. "Oh Yoko!" is a celebratory finale with none of the cloying self-obsession of John and Yoko's home movies. On two other songs where Yoko is not the dominant theme, she is nevertheless invoked through the "oh no, oh no" refrain. That's not to say that love songs predominate. Half of the material covers similar terrain to PLASTIC ONO BAND, but the themes are balanced by hope and even light-heartedness. "Crippled Inside" is leavened by its country stylings including Dobro, courtesy of George Harrison, who also spices up two of the album's pivotal tracks, "Gimme Some Truth" and "How Do You Sleep?" (the latter is a vitriolic attack on Paul McCartney). Outside of PLASTIC ONO BAND, this may be Lennon's finest solo album. 16. Oh Yoko! (Bahamas 1969) "
20. Happy Xmas (War Is Over) (alt mix) "